It might surprise you to learn there’s more to memes than lolcats and Oolong the pancake rabbit. Memes are highly effective tools for disseminating political messages, particularly in countries with few avenues for safe dissent. Here, internet artist and writer An Xiao Mina explores the political side of memetic culture. Visual memes slip past keyword algorithms, limiting the opportunities for internet censorship, giving citizens in countries like China a voice. Memes, being images, don’t “trip the censor alarm” as quickly. The image-based memes created to question the Chinese govern-ment’s official report into the Wenzhou train crash (two high-speed trains collided in July 2011, killing 40 people) was powerful. You saw a typical government response — the Chinese media reported that the collision occurred due to a lightning strike – and, for obvious reasons, people were questioning that explanation. One government official said, “Whether or not you believe it, I believe it.” The phrase became a popular internet meme. 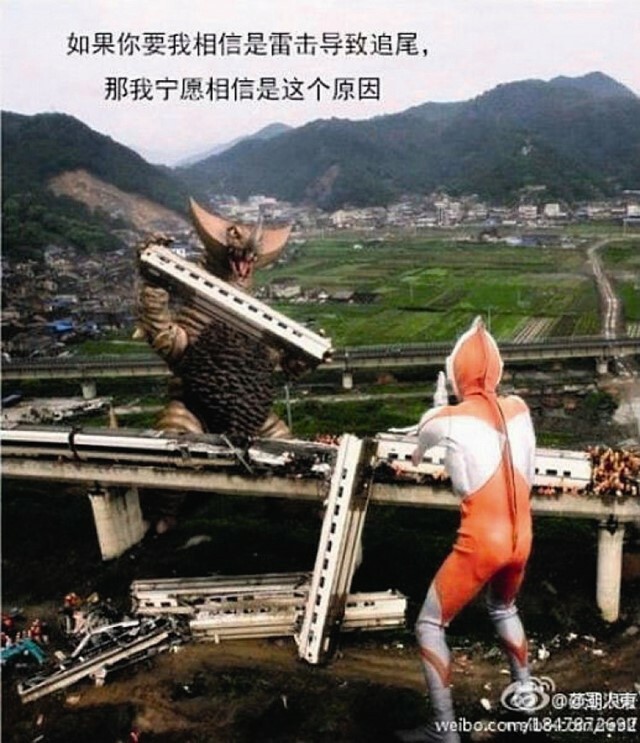 In one image, a Godzilla can be seen creating the collision, and the phrase appears remixed as, “I’d rather believe this than the official explanation for the train crash.” It is very difficult for the government to quash this kind of digital dissent. People are able to take part in a sophisticated analysis of propaganda, taking it apart and re-broadcasting it mockingly. Memes keep public discussion surrounding sensitive political issues alive. In the case of Chinese civil-rights activist Chen Guangcheng (released from prison after a four-year term in 2010 but then kept under illegal house arrest), you can’t draw a connection between the popular political meme created after his arrest and his escape from custody (in April 2012). It’s not that simple. What the meme did is keep the story alive in the media. Most Chinese dissidents are quietly oppressed — you don’t really hear about them. There are dozens and dozens of dissidents who’ve been disappeared, harassed or arrested that you’ll never hear about. In this case, Chen’s name was censored and memes were a critical way of keeping the discussion alive. One of the first memes was people wearing sunglasses in support of him, and you suddenly had all these images of people wearing sunglasses on the internet, which is impossible to suppress – how would a censor distinguish between a holiday photograph and one created for the purposes of dissent? Then the actor Christian Bale tried to visit Chen Guangcheng and was roughed up by the police. With this event came the “Batman vs Pandaman” meme (the cop involved was a round man who resembled a panda). Memetic culture became a sort of “counter-silence”, which doesn’t happen for most dissidents – other than Ai Weiwei, of course. The meme didn’t help Chen escape, but it created an ecosystem of support, a social signalling, which kept his name relevant. Memes can change the way societies view a political event by challenging the image presented by mass media. Timing is critical; we saw that with the #TweetLikeAForeignJournalist meme in Kenya. The topic of discussion was foreign representation of the 2013 elections in Kenya, which was generally negative, although the locals perceived the elections to be mostly peaceful. It quickly evolved into other memes, like #SomeoneTellCNN. These hashtag memes challenged the Western media’s coverage of the elections by pointing out that they were not the bloodbath Western journalists had expected. There’s an emergent internet culture that’s giving citizens a way to talk back and challenge preconceived notions of their societies. The culture of internet humour spreads quickly. Last year, many young Ugandans were preparing for the Primary Leaving Examination (PLE), the gateway test to being placed in a secondary school. Young tech-savvy Ugandans were creating fake test questions that might appear on the exam and tweeting them with the hashtag #PLE2012. This was a meme for the local population – very much in-jokes. Here’s one: “#PLE2012 English. Is the word #Museveni in Past Tense, Present Tense, Future Tense or Never Ending Tense? (10 marks)” This refers to Yoweri Kaguta Museveni, who has been president of Uganda for 17 years! The “elections” have been questionable. This meme wasn’t about getting people’s atten-tion on the other side of the world – it was about poking fun at the president and corruption, about sharing the general feeling of the public. It was one of the first times you had a lot of the Ugandan Twittersphere uniting like this.